50% of men in their 50s are affected by alopecia, more commonly known as baldness. Surgical treatments for hair loss is now possible to resolve the problem with a natural result and hair that will not fall anymore. 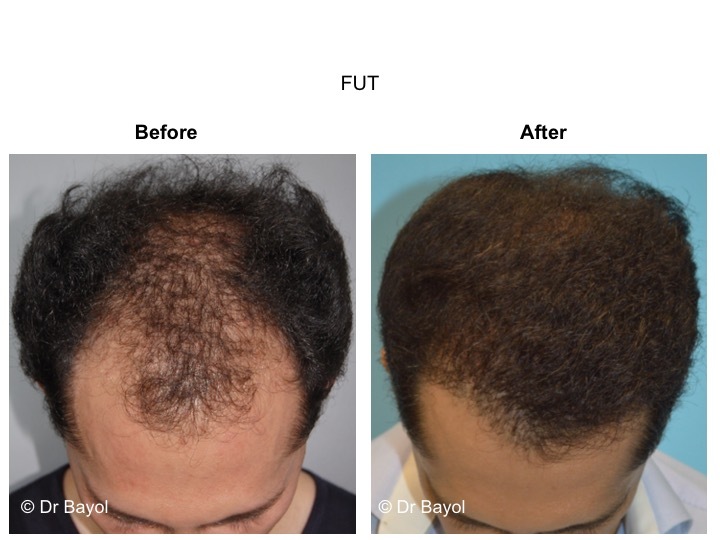 Thus, hair is taken from the patient in strip (FUT) or individually (FUE) depending on the surface that will need to be covered and will be transplanted on the bald areas. The hair loss surgical treatment at HAIRMEDICAL SWITZERLAND, aims to put hair back on the balding areas in order to re-densify them. However, this cosmetic surgical treatment will in no way stop or slow down hair loss. 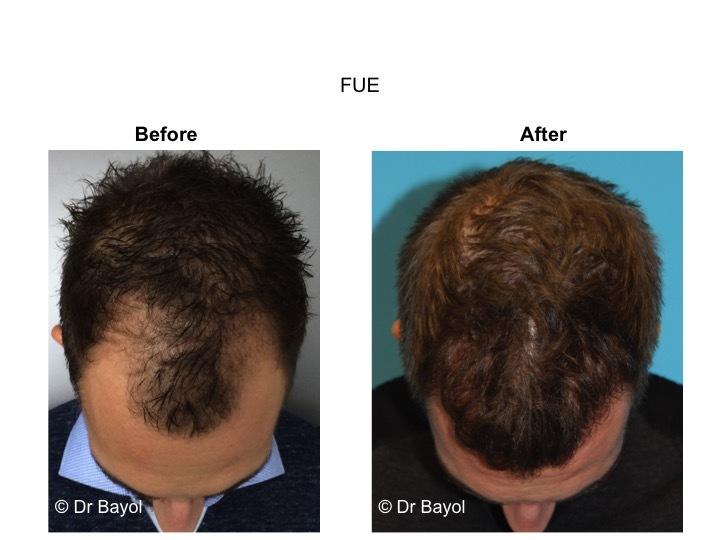 This is why it must systematically be associated to one or several medical treatments to fight hair loss before and after the procedure, to maintain and perpetuate overtime the result of the surgery. – The scalp skin flap: the aim of this technique is to reconstitute an anterior frontal hairline. A band of scalp, vascularized by vessels, is removed at the level of the temporal crown area. This skin flap is transferred to the hairline of the forehead. 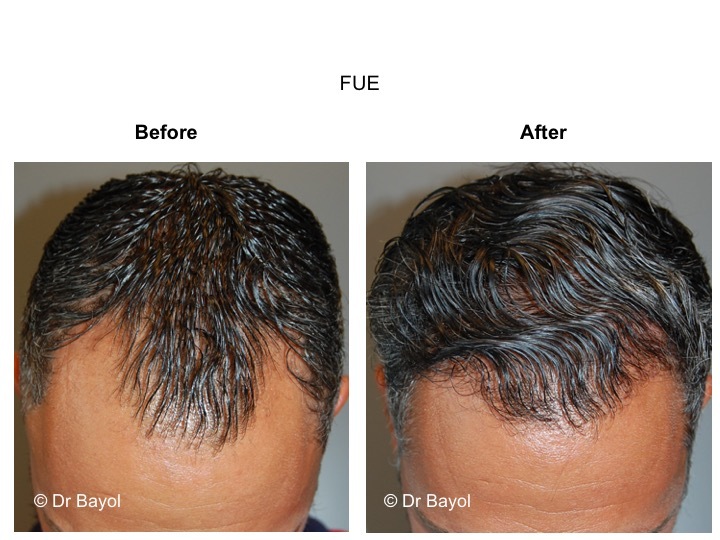 It is the only method that allows to bring a high density of hair in the frontal region in a single intervention. The disadvantage of this technique is that the scar from where the flap has been removed is often wide and under tension. 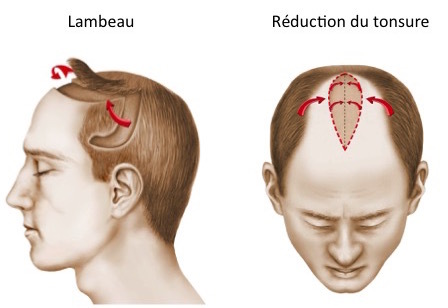 – The tonsure reduction: the aim of this method is to reduce the size of the baldness by iterative sutures of the glabrous skin. It is only possible if the scalp is sufficiently elastic. The aesthetic surgeon performs a resection of a skin flap measuring about 10 cm in length by 3-4 cm in width. This procedure can be repeated several times and facilitated by the installation of expansion balloons under the skin. As with the scalp flaps technique, this method has the disadvantage of causing large scarring. – The scalp lift: this method is heavier and therefore less common. It combines a large tonsure reduction associated with the use of one or two scalp flaps to close the reduction and cover the frontal area. This procedure is usually performed under general anesthesia. 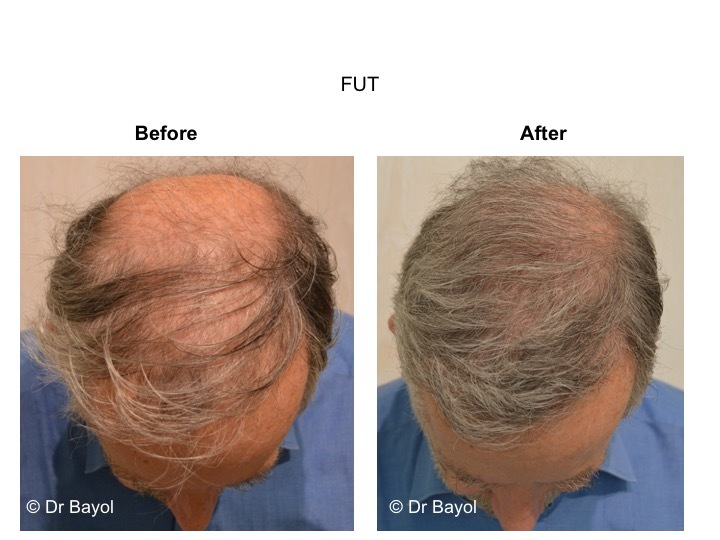 Progresses in the field of hair transplantation in Switzerland have been spectacular over the last twenty years. This revolutionary method makes it possible to obtain the most natural result possible with the use of grafted hair that will not fall. This procedure is suitable for both women and men. 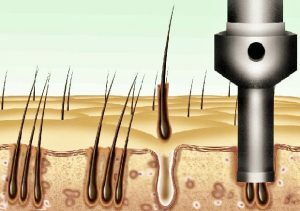 If there is only one surgical method, the capillary micro hair graft, there are two possible techniques of graft removal which have their own advantages and disadvantages: the FUT technique and the FUE technique. 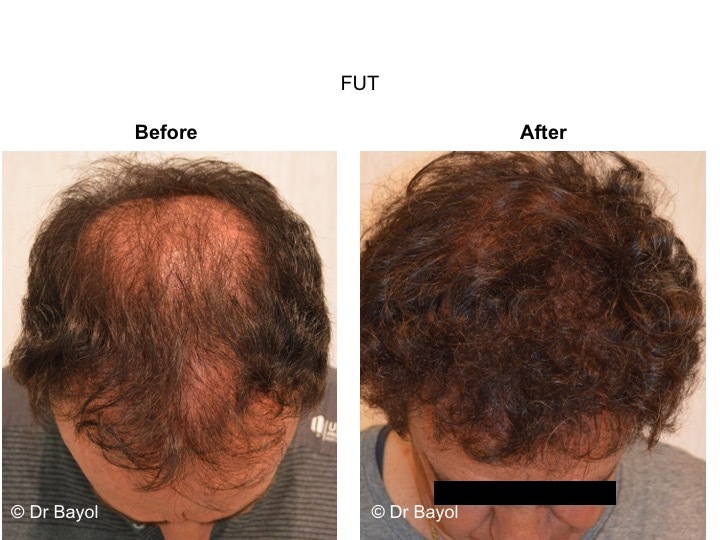 FUT stands for Follicular Unit Transplantation. A technique that can be performed at HAIRMEDICAL SUISSE, (Figure 2). The hair strip is removed at the back of the head, at the level of the crown, where the hair never falls. It is immediately cut into micro hair grafts or micro hair implants, which are grafted into the balding areas. The sampling area will be closed with a suture thread that will leave a thin transverse linear scar easily hidden by the hair (if it is more than 1 cm long). – It can be repeated several times (2, 3 or even 4 sessions), depending on the flexibility of the scalp. The only disadvantage of this method is the linear scar that it leaves. This scar is most often very discreet and easily hidden by the hair when it is more than 1 cm long. 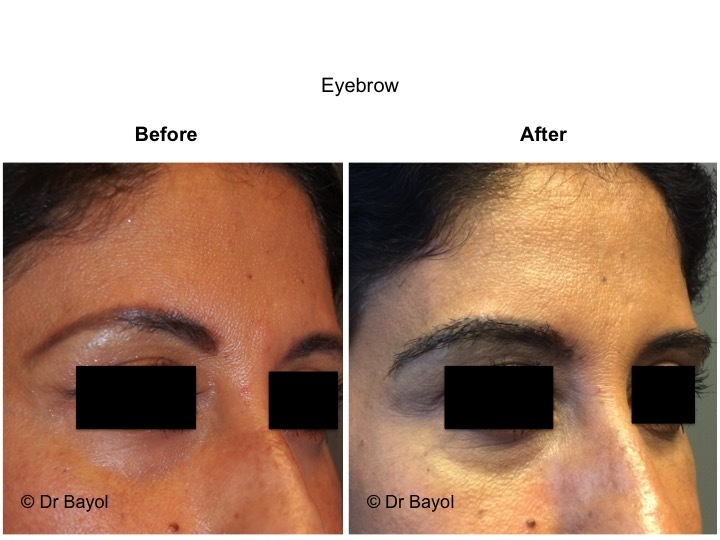 In the case of a visible scar due to its enlargement and / or several successive sessions, it can easily be concealed or even disappear with individual grafts and / or micro-dermopigmentation by tattooing. 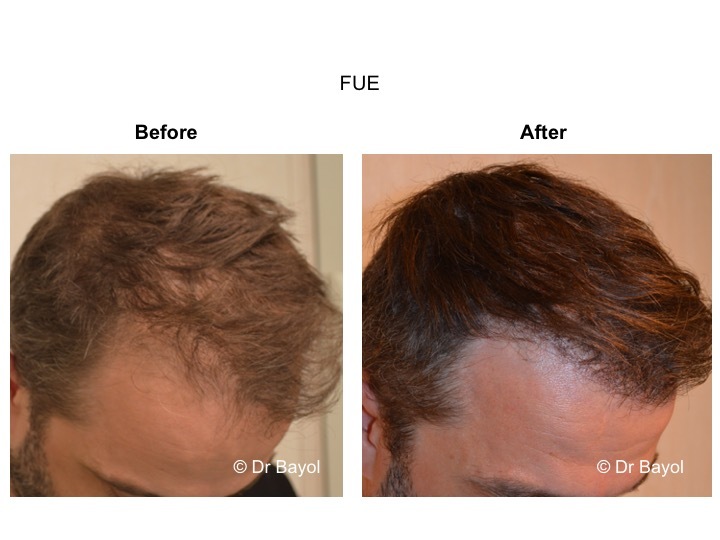 FUE stands for Follicular Unit Extraction. This technique can be performed at HAIRMEDICAL SUISSE (Figure 3). The grafts are extracted one by one at the level of the crown, after the complete shaving of a large surface to enable a large number of samples. The sampling is manual with a rotary motor or a pneumatic device like the HAIR MATIC SAFER® punch from the MEDICAMAT® brand. The sampling can also be semi-automated by using an ARTAS® robot. Each graft will be grafted into the balding area. There are no visible linear scars left after the procedure. This technique takes an increasingly importance in the field of baldness cosmetic surgery in Switzerland, because it has a certain advantage: the micro-scars left by the sampling are almost invisible to the naked eye even if the hair is very short. It cannot be repeated too many times, at the risk of having a scalp transformed into a diffuse cicatricial area at the level of the crown due to successive micro-samplings. The need to shave a large surface of the scalp, makes this method inadequate for women, especially since the hair density of a female patient is often low in case of alopecia. 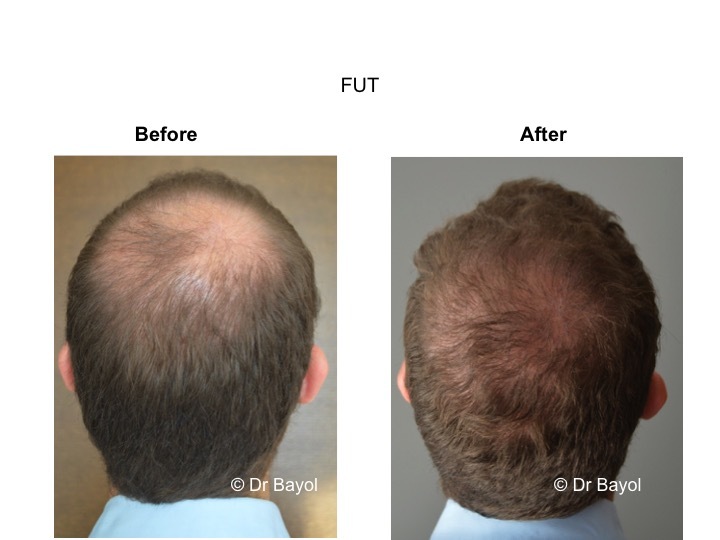 – In advanced and extended stages, after two or three sessions of FUT, in order to perfect the result (especially in the frontal hairline and the temples) and to conceal a possible enlarged sampling scar. 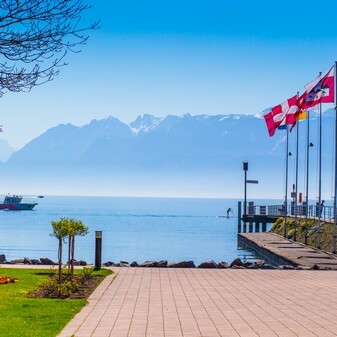 Hospitalization related to a hair surgical procedure is performed as an outpatient surgery at Laclinic in Montreux near Lausanne and Geneva, as part of HAIRMEDICAL SUISSE. You will check-in in the morning of the procedure and will be able to check-out at the end of the day, after a few hours of monitoring. Most often, a hair micro-graft is performed under local anesthesia. 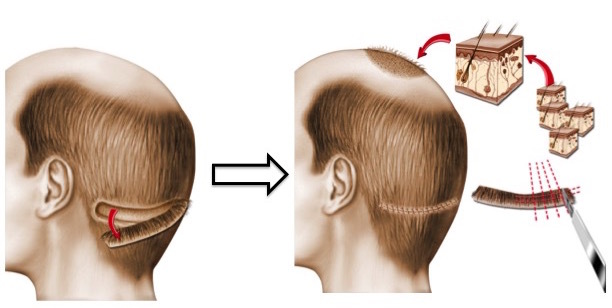 Regardless of the sampling technique (FUT or FUE), the method of the hair transplant reimplantation remains the same: small perforations are made in the balding area(s) and the hair grafts are individually put in place in these perforations. 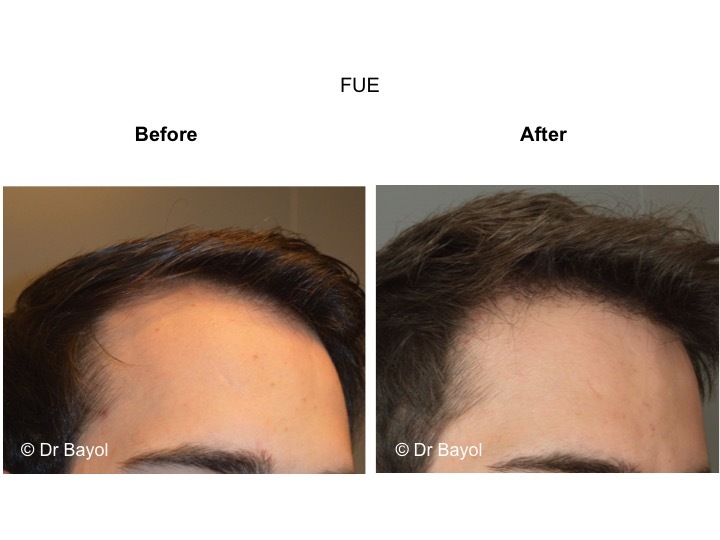 The procedure is long, a FUT session can last from 4 to 6 hours and a FUE session from 6 to 8 hours. It is essential to know that several sessions may be necessary to obtain a sufficient density. 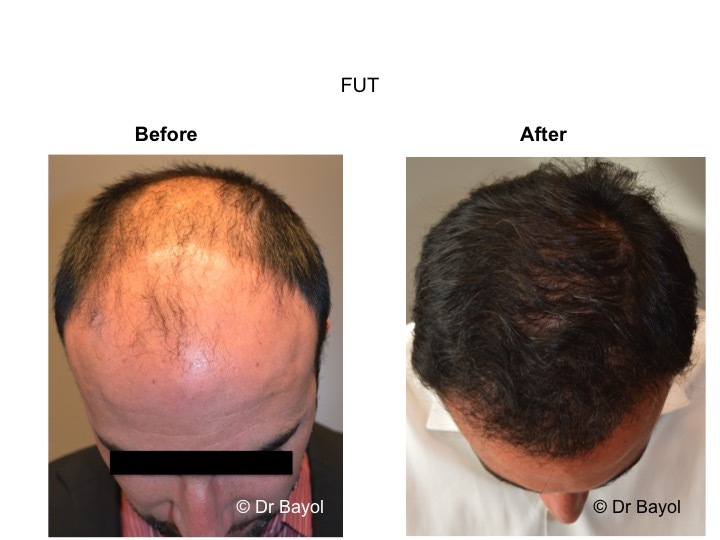 A hair transplant session may be associated with a Platelet Rich Plasma treatment (PRP) that will help the hair implantation. Indeed, a PRP treatment consists in injecting a serum enriched in platelets, as a product of regeneration and bio-stimulation, the concentration of Platelets promoting the wound healing process. The most common follow-ups consist of edema (swelling) and facial bruises of which the size and duration may vary from one individual to another. However, in order to reduce the importance and the duration of these postoperative effects, you will be systematically taken care of by the department of physiotherapy, for a postoperative care. The check-out will happen on the same day, in the case of an outpatient hospitalization, or the next day, if you stay in hospital overnight. After you have returned to the room and took your meal, the physiotherapist will perform a gentle facial massage and give you a LED care to facilitate the lymphatic drainage and promote the healing process. There is no real pain after the procedure, but rather a sensation of tension in the scalp. Analgesics as well as a local care will be systematically prescribed. The first gentle shampoo can be made on the fourth day after the procedure, sports activities can be resumed after 1 month. The small scabs that will form on the grafted hair will fall with hair grafted between 10 and 20 days. The new hair will begin to grow back between the 4th and 6th month after surgery at a rate of approximately 1 cm per month. The final result can only be evaluated after 9 to 12 months after surgery. Whatever the method of sampling that has been carried out, because of the facial swelling and bruises, a week of socio-professional leave must be scheduled. The sport activities can be resumed between the 4th and the 6th week after the procedure. As it was explained above, it takes 4 to 6 months to start seeing the first grafted hair regrowth. 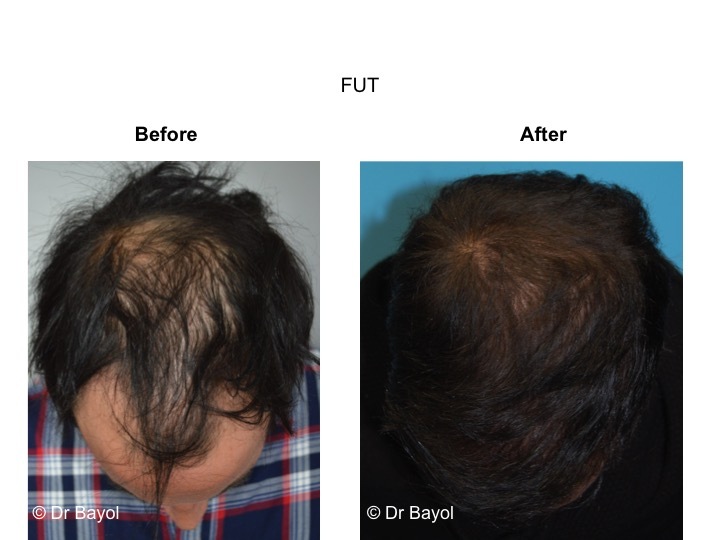 The result of hair micro-grafts will be considered final after one year. Depending on the patient and the baldness extent, several hair transplant sessions are sometimes necessary to obtain a sufficient hair density. These sessions must be spaced by a six-month period. Imperfections may result from a misunderstanding of what can reasonably be expected by the patient. In order to avoid any misunderstanding, it is important to note that it sometimes takes several hair transplant sessions to get a good density. 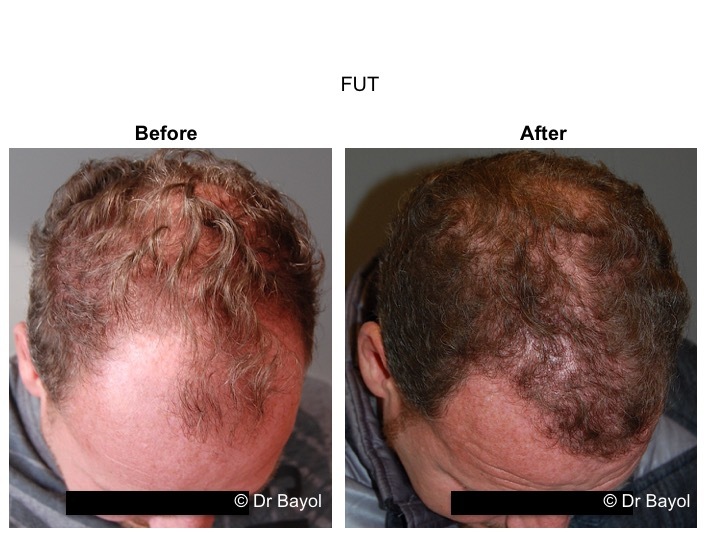 The correction of alopecia by hair implant, is a cosmetic surgical act. Nevertheless, it remains a true surgical procedure, which implies risks associated with any medical and surgical procedures, however small they may be. The complications related to local anesthesia are rare or even exceptional and it is necessary to specify, during the first medical consultation, any antecedents of reactions related to local anesthesia, especially during dental care treatments. Whether anesthesia is local, conscious (neuroleptanalgesia) or general, a hair transplant must be performed in real surgical conditions at Laclinic in Montreux, or at the Forever Laser Institute in Geneva. With regard to the surgical procedure, the choice of a qualified, competent and serious cosmetic surgeon trained in this type of intervention makes it possible to minimize the risks of complications without being able to completely eliminate them. – Hair loss and temporary alopecia: hair loss can frequently be observed around the grafted area 15 to 20 days after surgery. This fall is mostly temporary and is called telogen effluvium. Its incidence is diminished by the local application of Minoxidil 5% on the periphery of the scalp the day after the procedure. – Hematoma: It is rare, most often moderate and not serious. If it is important, it can be drained and may require surgical correction. 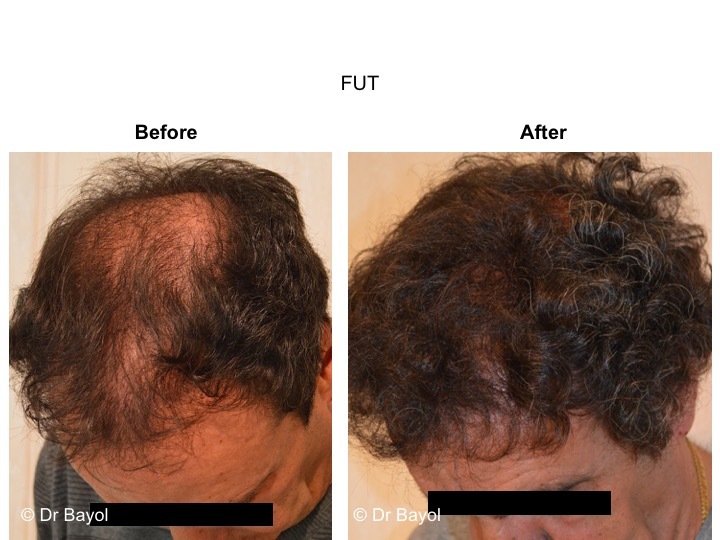 – Infection: it is exceptional in the case of a hair transplant. It usually consists of micro-abscesses. Simple local care allows a complete recovery. – Healing troubles: These scarring disorders are rare in the areas where hair grafts have been sampled. Most often, it is due to a scar enlargement (which can be concealed by a dermo-pigmentation or FUE). – Epidermal cysts: These cysts can occur on hair implants when the hair grows back, between the 4th and the 6th month after the surgery. Usually, they are spontaneously eliminated. Otherwise, they can be easily removed and do not affect the quality of the final result. Do not overestimate these risks, but bear in mind that a seemingly simple cosmetic surgery always involves a small amount of hazards. The use of a competent cosmetic surgeon guarantees you that he has received the appropriate training and that he has the necessary skills to avoid these complications, or treat them efficiently if they were to occur. Dr. Jean-Charles BAYOL specializes in facial cosmetic surgery. 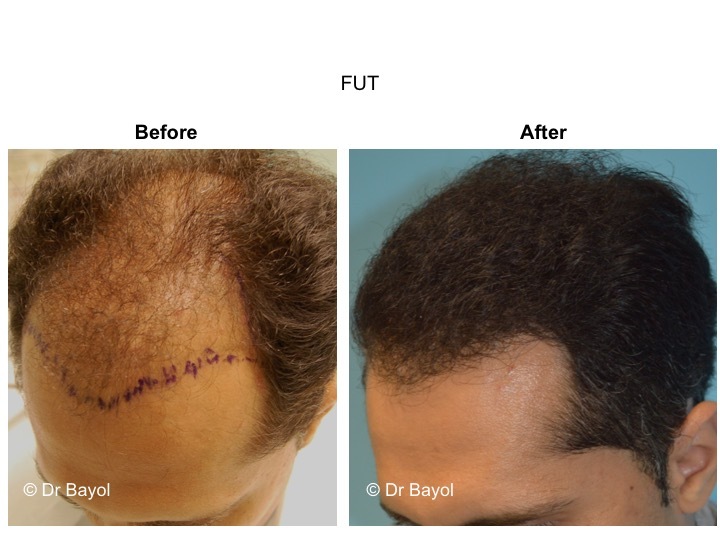 He performs hair grafts and implants only in official surgical structures in Geneva and in Montreux near Lausanne (Switzerland). 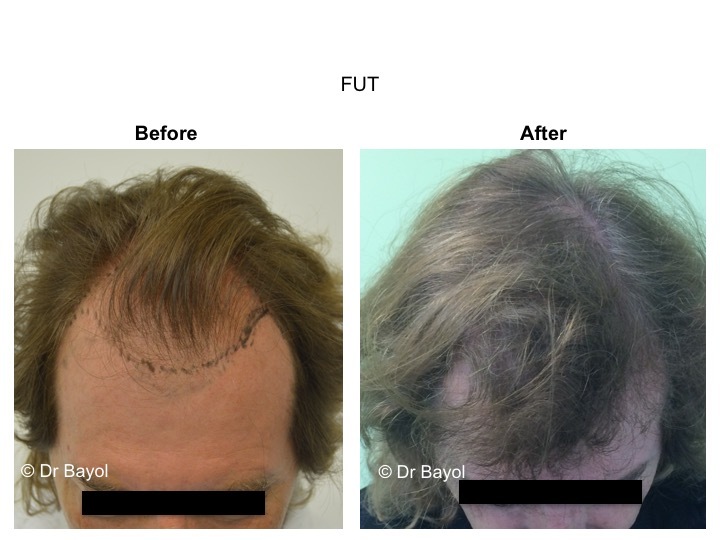 The surgery of the baldness and the hair implant techniques give a great satisfaction to the patient who feels a real psychological improvement. Most often, several sessions (2 or 3) of hair micro-grafting are necessary. 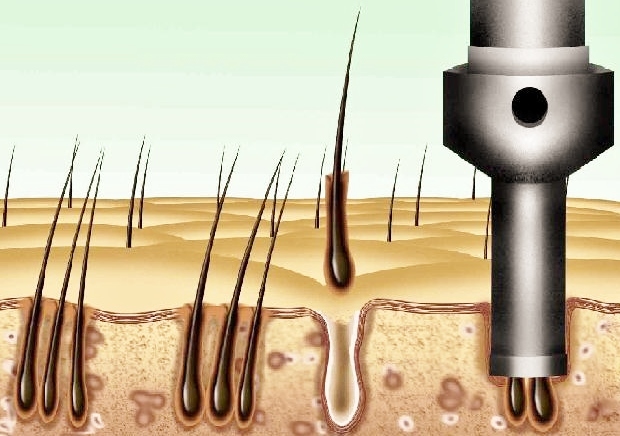 The Follicular Unit Extraction technique (FUE) consists in an extraction of the follicular units without scars. 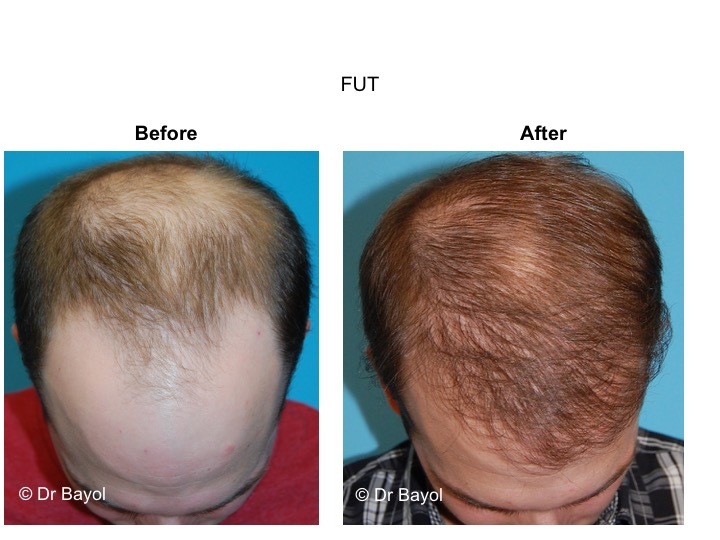 This method takes an increasing importance in the therapeutic field of hair grafts. 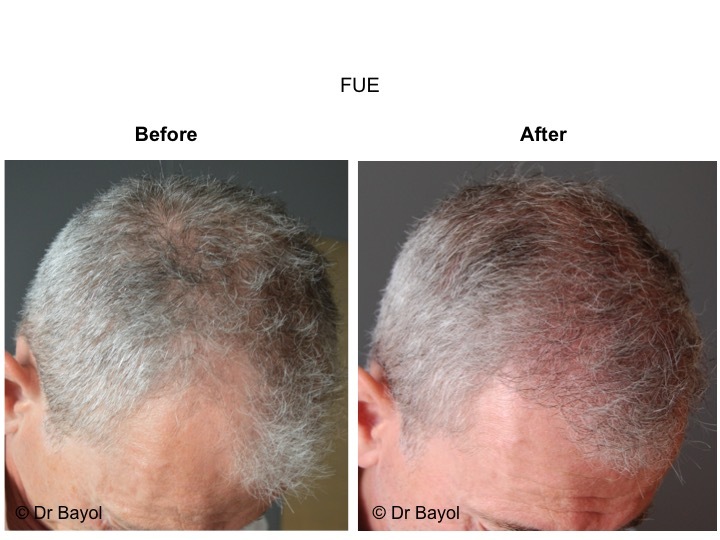 An injection of PRP (Platelet Rich Plasma) in the scalp can be easily done during the consultation and will stimulate the hair implants. Doctor Jean-Charles Bayol, physician and plastic surgeon welcomes you in the best Swiss institutions in Montreux, Geneva and Lausanne.